Murray helped Pools into the FA Cup second round after the win against East Thurrock. Hartlepool United boss Paul Murray says there is a "fresh slate" for the squad of League Two's bottom side and all the players have an opportunity to impress. Murray took over in October and has won one and drawn one of three matches in charge - progressing in the FA Cup. Striker Marlon Harewood was one player brought back into the side after a spell on the sidelines. "It's a fresh slate for me, everyone just needs to relax and play football," Murray told BBC Tees. "If they're not doing it for me on the park, they won't be playing, so when you get the chance, take it. "They need to keep hold of it and don't let anyone take it away from you. "I've just been honest with the players." 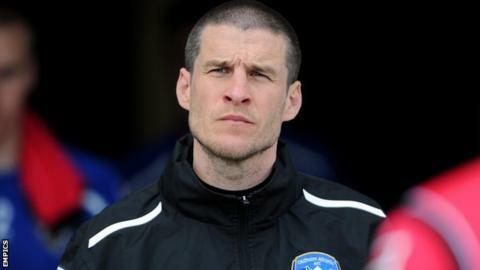 Sidney Schmeltz and Nicky Featherstone have arrived on free transfers following the former Oldham assistant coach's appointment, and further players could follow. "We're always in the market, we're looking about," added Murray. "We'll see what happens."